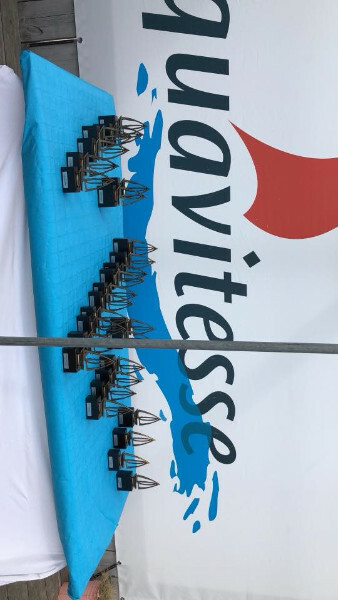 25 boats entered the Dutch National Championships for the RS500 class on 15th/16th September at Aquavitesse in Bruinisse, just south of Rotterdam. The majority were Dutch boats, but the international flavour of the fleet drew entries from France, Belgium, the UK and even the Czech Republic. We were all treated to a weekend of early autumn sunshine, warmth, and some good moderate breeze (although a few teams were looking for something a bit more testing). We were sharing with the Feva and Aero fleets, and although the various possible start orders and course signals seemed complicated when we were on shore, in the event we stuck with the same one throughout the regatta, and it all worked out very smoothly. Saturday saw a westerly breeze, which developed a light chop on the water as the wind steadily built. However, for the first race of the day the wind was light enough that we were soaking downwind and searching for pressure in both directions. The defending champions, Bruno Goris and Edith Kanters clearly liked the conditions and disappeared into the distance to take the win. Michiel and Hilde Geerling-van Susante, newly moved to the UK (so should they have had GBR on their sail? ), took second and Peter and James Curtis (considerably longer residents of the UK) came through from a very average start and first beat to take third. The breeze started to build and for the second race we were starting to heat up the downwind legs. As ever with the RS500, choosing exactly when to change modes is very critical and can lead to big gains and losses. This race saw Peter and James take the win, with Bruno and Edith second. Race 3, and the wind was now strong enough to be fully powered up in both directions. Anneke Kikkert and Floris Staples took an early big lead in this race, but weren’t able to hold on, and surrendered to Michiel and Hilde. The standard in the top half of the Dutch fleet has definitely improved in the last couple of years, putting a real premium on getting a good start and first beat. Peter and James found this out to their cost, as they could only scramble their way back to 6th from another poor start. The final race on Saturday saw Peter and James and Michiel and Hilde get away from the fleet. The wind had started to ease off towards the end, which favoured the lighter team of Michiel and Hilde, who could plane at a slightly deeper angle. This allowed them to gybe on top of Peter and James on the final run and go to take the win. Bruno and Edith were 3rd, and brother and sister team of Thomas and Marloes Rot took their third 4th place in a row. So overnight, with no discard yet, Bruno and Edith led with 9 points from Michiel and Hilde and Peter and James, both on 12. The competitors were all treated to excellent local Mussels in the evening and much discussion about the forecast and whether the wind would blow up a bit more. As it turned out, the wind didn’t follow any of the forecasts we had been examining and was similar to, but slightly lighter than Saturday. The big change was the direction, which was now from the south and kept the water flatter and more shifty. Peter and James managed the conditions well (and improved their starting somewhat) and took an easy win in race 5. The lighter, shiftier conditions saw some big changes in the fleet, with Johan van Veen and Iris Prummel taking 2nd, having done no better than 10th on the Saturday, with Bruno and Edith 3rd. Peter and James then won race 6, with Bruno and Edith 2nd, Michiel and Hilde 4th and the discard coming into play. This put Peter and James into the lead, but nobody could afford another bad result. Race 7, and Bruno and Edith took an early lead and pulled away. Peter and James closed up on the last run, but not enough to test Bruno and Edith’s boat handling under pressure. Michiel and Hilde were 3rd, so going into the final race any of the top three boats could still win the event. Peter and James had perfected their committee boat start technique during the day and had another good one. Once most of the fleet had tacked off to the starboard side of the course they found themselves in a loose cover position on both Bruno and Michiel. The port side of the course was clearly favoured by now, and all three pulled out a long lead on the fleet. Bruno didn’t quite have the pace in this race and it became a duel between Peter and James and Michiel and Hilde. The latter team took advantage of some awkwardly placed Aeros to take the lead and despite a very intense gybing battle down the last run they held on to take the win. 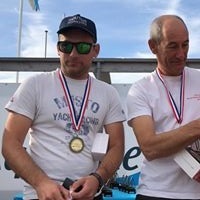 So Peter and James took the overall title, with Bruno and Edith second and Michiel and Hilde third. Aquavitesse laid on a fabulous event, with really slick race management, and the Dutch fleet were all very friendly and welcoming, despite a foreigner coming in to take away the title. They even did the prizegiving in English for the benefit of the international visitors. Many thanks for a great weekend.